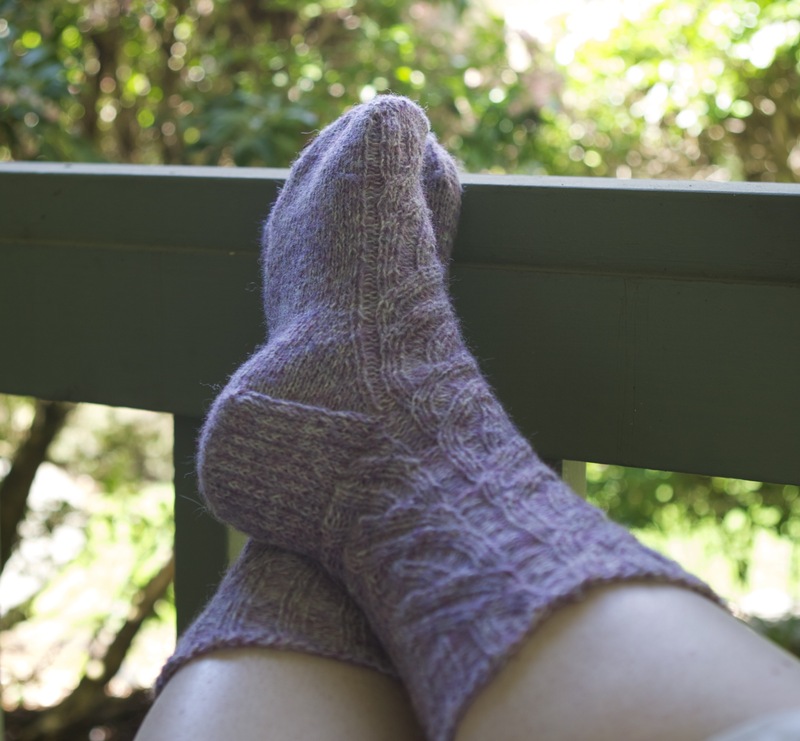 Way back in April of 2010, I made my first pair of socks. 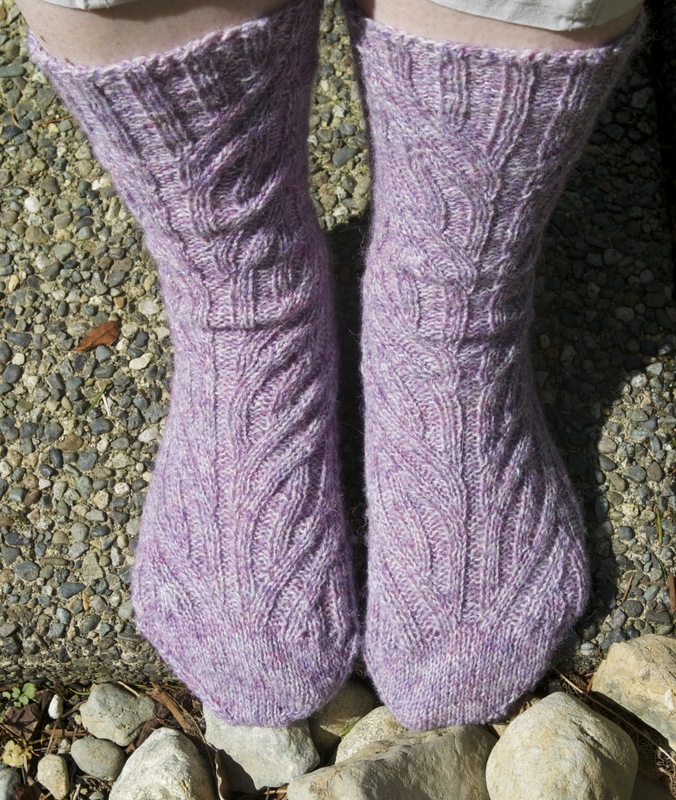 They were rather boring beginner simple socks; long ribbed cuff and plain stockinette stitch feet. 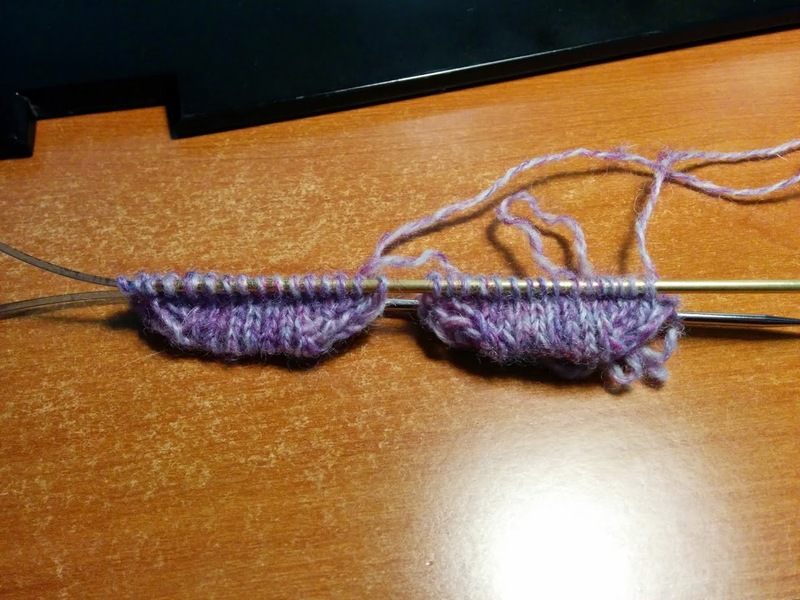 I didn’t really understand about gauge and seaming so they didn’t fit me very well and so the first sock was an experience, and the second sock was… a chore. This is apparently a pretty common issue with socks. Common enough they call it Second Sock Syndrome. In 2012, I actually spent the whole year knitting Christmas Stockings. This safely avoided the problem because this meant there was only ever ONE of a sock. But I’d see some absolutely stunning looking socks people would make, and I’d have this internal debate on if I dare try socks again. Well… reddit knitters do monthly knit-a-longs, and for the month of April… it was socks. So I jumped in with two feet! I knit these two at a time from the toe up. And when I tried to explain the method to the non-knitter Ben he looked at me like I was a witch. (Think Monty Python “She’s a Witch!” not Salem Witch Trials) So I’ll try to explain and if it doesn’t make any sense to you either, you can just skip ahead to more photos. Basically you have two needles (circular or double pointed) with your sock toe stitches split so that your top/front of your socks is on one needle and the back/bottom of your socks in on the other needle. If you are using double point needles you’d need a third needle for working, if you are using circulars then you just need two with decent length. It may help to have two of differing colors or materials so that you always knit back onto the same circular you are knitting off of and don’t grab the wrong needle. So in the photo above let’s say that’s Sock A on the Left and Sock B on the right and my yarn is at the right sides of the socks. 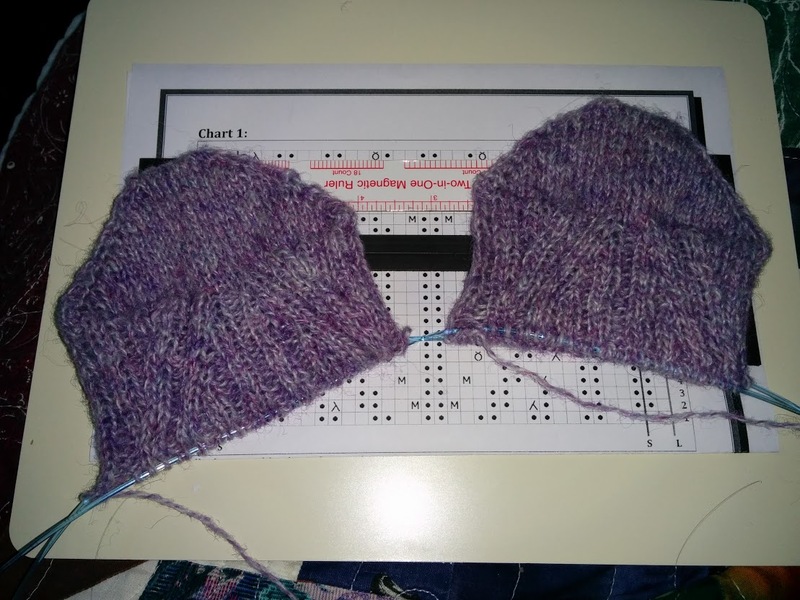 I’d first knit the front of Sock B (right) Then set that yarn (Sock B Working yarn) aside and pick up the other yarn (sock A working yarn) and knit the front of sock A (left). Then you turn the work so you can work the backside of your socks. Since you turned your work over, now Sock A is on the right, and Sock B is on the left. Work the backside of Sock A, swap back to the B sock yarn, then knit the Backside of Sock B. Turn your work and you are back at the beginning of the process, ready to knit the fronts again. So you have two yarns going to your needles, each for its own sock, which are growing out from some toes. Now there are a few ways people go about their two at a times. Some people work one sock per ball and have two balls of yarn either store bought OR people divide their yarn by weight. And then there is how I did it…. I wound my hank of yarn into a center pull ball (Using my ball winder I got with Christmas money!) and did one sock from the yarn at the center, and one sock from the yarn around the outside. I decided to go that route because my yarn was a recycled yarn of which I had 340 yards and I do not own a scale. The pattern itself was calling for 350 to 400 yards so I was a bit nervous I might have to make my socks a wee bit short, which was another vote for doing my socks two at a time. My lavender heather yarn is a pretty close match to my actual heather blooms! I am rather pleased to report that these second set of socks came out just fine, at mid calf length with plenty of yarn left. And while I am reporting on things… I did need to stop at a yarn shop for needles, so I managed to get out to Serial Knitters in Kirkland, WA and they were very helpful and it looked like they have a nice selection. They offered me needles in Nickel plated or Brass and quite frankly I had to ask what the difference is. Nickel plated is a very smooth and slick option. The Brass has a bit more grip, but smoother than the wood or bamboo I’ve used. I think, but I can’t seem to find a link that specifically mentions it that the reason the Brass grips a bit more has to do with the tarnish it picks up from the oils in your hands.